Thank you to everyone who joined our Immunization Update Webinar! We were glad to support and connect with our local immunization champions! Leadership: The candidate is considered an authority on immunization in his or her community, medical system, or individual practice. Activities may include acting as a spokesperson, trainer, mentor, or educator. 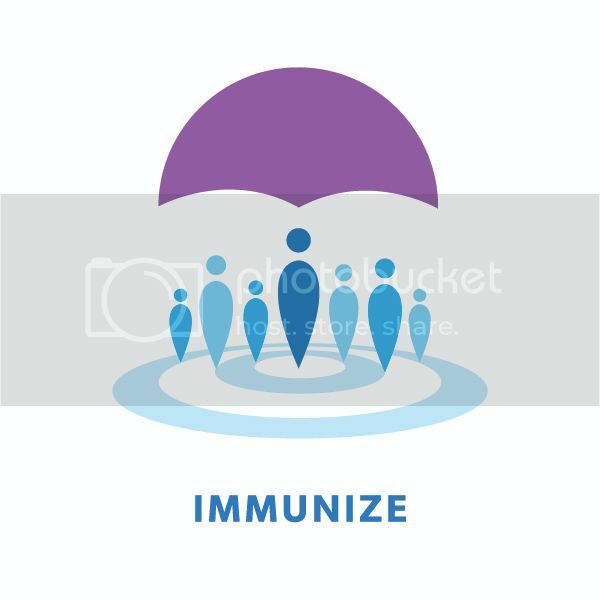 Innovation: The candidate has used creative or innovative strategies to promote immunization or address challenges to immunization in their practice, community, state, or region. Activities may include both new strategies and adapting existing strategies in new ways such as for reaching under-immunized populations. Champions may include coalition members, parents, healthcare professionals (e.g., physicians, nurses, physicians’ assistants, nurse practitioners, medical assistants, etc. ), and other immunization leaders who meet the award criteria. Self-nominations are welcome, or you may submit a nomination for a deserving individual. State immunization program managers, state and federal government employees of health agencies, individuals who have been affiliated with and/or employed by pharmaceutical companies, and those who have already received the award are not eligible. Awardees will be announced during National Infant Immunization Week (NIIW), April 27–May 4, 2019. Champions will be featured on CDC’s web site and may be recognized by their immunization program during NIIW. A public hearing has just been scheduled for Hawaii Administrative Rules relating to Immunization (HAR 11-157). This policy will revise the current immunization policies for school attendance and entry. Please submit testimony in support of these policy changes. All testimony shall be received no later than Wednesday, November 7, 2018 at 12:00 p.m. (noon) Hawaii Standard Time. Persons who are not able to attend the public hearing may submit written testimony to the DOH by mail at the Disease Outbreak Control Division (DOCD), 1250 Punchbowl Street, Room 443, Honolulu, Hawaii 96813 or by email at immunization@doh.hawaii.gov. Thank you for this opportunity to provide testimony. As a community member and public health advocate, I am writing to strongly support the HAR 11-157 proposed rules update. 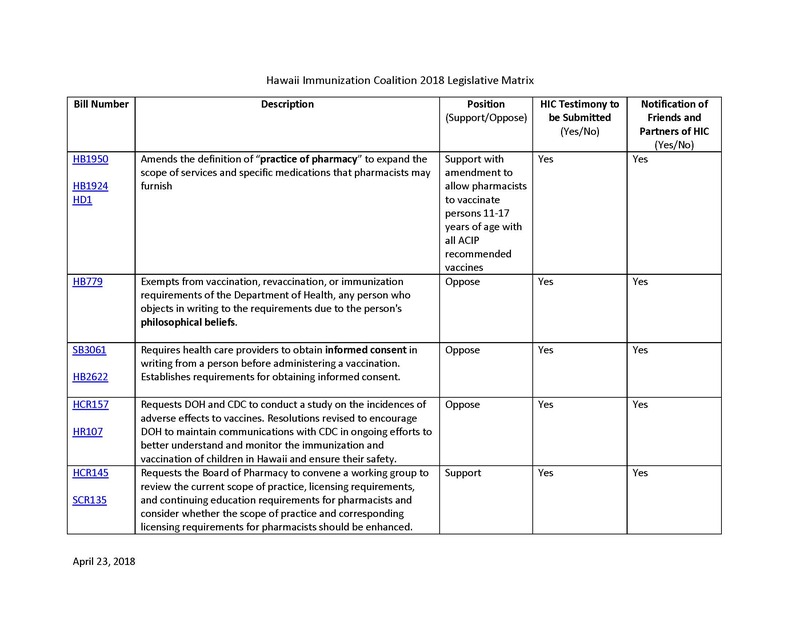 These proposed changes will bring Hawaii’s rules into compliance with the most current recommendations of the Advisory Committee on Immunization Practices (ACIP). The proposed rules update is especially important for students first entering 7th grade or higher to receive the HPV, MCV, and Tdap shots because of low uptake levels. This is especially true for the HPV vaccine which prevents HPV-related cancers that might otherwise occur later in life. The Centers for Disease Control and Prevention (CDC) advises that state and local vaccination requirements for daycare and school entry are important tools for maintaining high vaccination coverage rates, and in turn, lower rates of vaccine-preventable diseases. No vaccine is 100% effective for everyone and not everyone can be vaccinated. Newborns and those with compromised immune systems – such as those experiencing chemotherapy or with autoimmune conditions – cannot be immunized. If approximately 93% of the population is vaccinated, vulnerable groups will stay protected. Immunized students are protected from vaccine-preventable diseases and protect those who cannot be immunized. Research demonstrates that communities with more vaccine exemptions are at greater risk for vaccine-preventable disease outbreaks. Limiting exemptions to those that are medically indicated improves protection for our entire community, including those who are particularly vulnerable, the very young and our elders. I respectfully request that the proposed changes to HAR 11-157 be supported and passed for the health of all of our communities. Hawaii Immunization Champ for 2018! HIC congratulates Dr. Michael Hamilton for being recognized as Hawaii’s 2018 CDC Childhood Immunization Champion! As former President of the American Academy of Pediatrics (Hawaii Chapter) and a pediatrician at Kaiser Permanente, Dr. Hamilton has advocated in the legislature to keep our children safe from vaccine-preventable diseases. As a medical provider, he continues to promote immunizations for children by educating parents. Through his commitment and efforts, he has helped keep both his patients and the communities in Hawaii healthy. Mahalo, Dr. Hamilton!